String a bicone crystal, a seed bead, a fire-polished bead, a seed bead, a bicone crystal, a seed bead, a fire-polished bead, a seed bead, a bicone crystal, a seed bead, a fire-polished bead, a seed bead, a bicone crystal, three seed beads, a bicone crystal, a seed bead, a fire-polished bead and a seed bead. Step 8: String a bicone crystal, a seed bead, a fire-polished bead, three seed beads, a fire-polished bead, a seed bead and a bicone crystal. 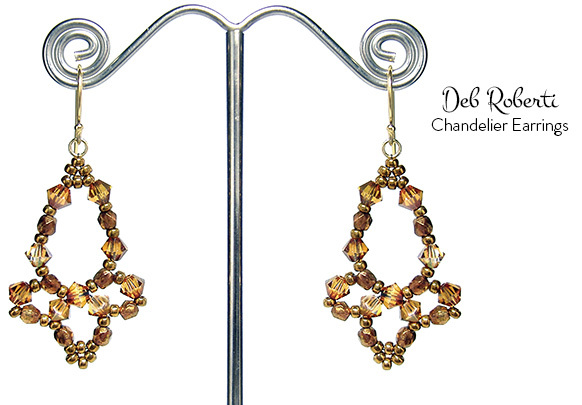 Weave your way back into the earring, knot and cut your thread. Thread your needle with the tail from Step 1, weave your way into your earring, knot and cut your thread. Attach your earring finding to the jump ring.